For every Allen Iverson or Shaquille O’Neal that makes it to fame and fortune in the NBA, there are hundreds that don’t. Hoop Dreams (1994) is a documentary that follows two Chicago inner-city boys from their freshman year in high school to their freshman year in college as they try to make it into the NBA. The film not only focuses on the pursuit of their dreams but how it affects their families. We first meet William Gates and Arthur Agee at age 14, both dreaming of playing basketball in the NBA. These kids live in economically depressed areas and watch their favorite players, Michael Jordan and Isiah Thomas respectively, on television. They clearly idolize and want to be like them. High schools have part-time talent scouts checking out parks and neighborhood basketball courts for raw talent. This is where Arthur is spotted. He and his parents go for an interview with St. Joseph’s prep school basketball coach who impresses upon them that he has to maintain good grades if he is to stay on the team. Arthur even gets to meet and play against his hero, Isiah Thomas. William is also trying to get into St. Joseph’s but his mother, Emma, wants her children to graduate high school above all else. They both get in—Arthur to the starting team and William to the varsity team—and endure a three-hour commute to school. William seems to be struggling on the team but is a fast learner when it comes to his classes. Arthur is the exact opposite: he excels on the team but doesn’t do as well academically. By the end of their freshman year they have changed places with William doing better on the court than Arthur and being touted by local media pundits as the next Isiah Thomas. However, the two families, even with the aid of scholarships, have trouble paying for their sons’ schooling. Arthur can’t afford to go to St. Joseph’s after the first year and his mother feels baited and switched by the school. It is clearly bitter resentment and perhaps rightly so. William, on the other hand, is luckier and finds a rich, white patron to cover the other half of his tuition. It quickly becomes obvious that if Arthur had been a better ballplayer he would have probably been allowed to stay at St. Joseph’s. There are some truly heartbreaking moments, like when Arthur’s mom loses her job. We watch, over Arthur’s shoulder and see his estranged father buying drugs off the playground court. We see William failing to make a crucial foul shot that he badly needed in order to prove that he was able to bounce back from an injury. These aren’t actors playing a role but real people and real lives that are hanging in the balance here. For a documentary that is almost three hours it doesn’t take long to get sucked into the absorbing story of these two boys. We watch them grow up both physically and emotionally, struggling to realize their dreams and this makes for truly compelling drama. This is a fascinating look at two boys and their families: their triumphs and their failures with an unflinching eye. Hoop Dreams cuts through the gloss and sheen of the NBA propaganda to show the harsh realities of what it truly takes to make it and how easy it is to fall short. This new Blu-Ray transfer is definitely an upgrade from Criterion’s DVD version with more detail apparent and sharper image, which also draws attention to the film’s low-tech approach, but in a good way. 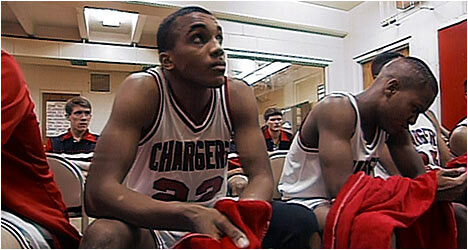 New to this edition is a 40-minute retrospective documentary entitled, “Life After Hoop Dreams,” which catches up with Arthur and William as well as their families. This fascinating doc. takes a look at what happened to them after the film premiered in 1994. Also new to this edition are 20-minutes of additional scenes that didn’t make the final cut of the doc. or are alternate edits of scenes. There is an audio commentary by filmmakers Peter Gilbert, Frederick Mark and Steve James. The original proposal was for a 30-minute documentary short for PBS and it grew organically from there. They talk about how they met Arthur and William and how, over time, they were able to gain the trust of the boys’ families. This is a good, inside look on the filmmaking process, how it came together and the challenges they faced over the five years of filming. There is also an audio commentary by Arthur Agee and William Gates. It is great to hear the two main subjects of this documentary talk about their impressions of the movie and their experiences after all these years. We get real insight into how they viewed the filmmakers intruding on their lives. They both speak very candidly and eloquently about their lives and the film. “Siskel and Ebert.” The famous film critics were very taken with this documentary and championed it on their show whenever they could. Included is their initial review, their pick for the best film of the year and their message to the Academy to nominate it for Best Picture. It was subsequently snubbed in the Best Documentary category prompting Siskel and Ebert to take the Academy to task which prompted an overhaul of the system (which certainly paved the way for Bowling for Columbine to win the year it came out). Also included is a music video for the film’s theme song, directed by Peter Gilbert and performed by Tony M. This was created to promote the soundtrack CD and is rarely seen. It is pretty standard stuff with clips from the documentary mixed with Tony M. rapping. Finally, there are two trailers.